Ooey, Gooey LEGO Slime Sensory Bins That You Have to Dip Your Fingers Into! 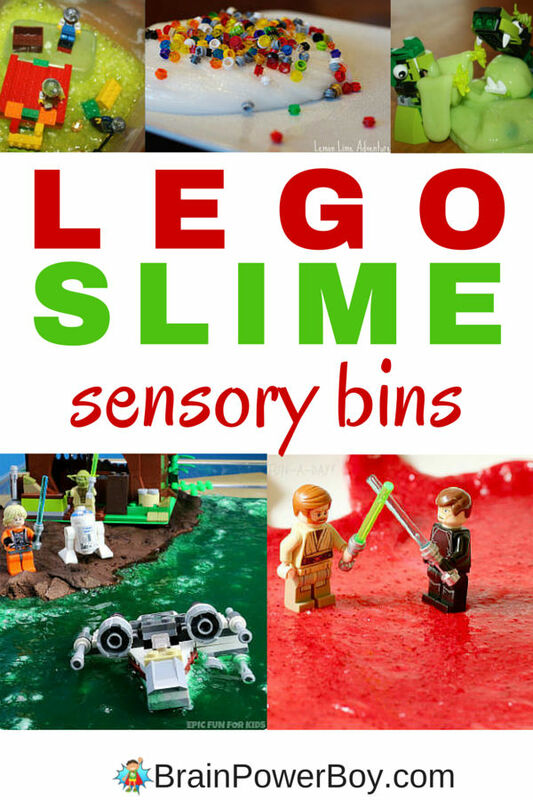 Have fun with these “awesome” LEGO slime sensory bins! As you may have figured out already we are big into LEGO here. We love it! It is always fun to combine LEGO with other activities to make them all the more fun. Making slime is a great science experiment. You can introduce the word polymer and talk about it a bit. Plus you are concocting a new material from other materials. Add to this the fun play aspect of LEGO and you have yourself a winning activity boys will enjoy. I found a video to explain a bit of the science behind slime and share that below. The first one is an ooey, gooey white slime with minifig heads and studs. A lot of fun play opportunities here as you can add whatever pieces you would like and create a theme. LEGO Minifig slime. Molten Lava Slime! This is so neat. The color is fantastic and . . . Bonus – it is done with LEGO Star Wars . You make 4 batches of slime in different colors so he will have a blast mixing colors as well. Another LEGO Star Wars winner here. Yoda’s Swamp Bubbling Slime World–how can you go wrong with a name like that?! Green slime that bubbles, yes, it actually bubbles. We like this so much. They made a playdough island for land. Using LEGO Mixels with slime is a great idea! They are certainly slime worthy. They look so alien-like (at least I think they do—do you?) This one is a totally lime-green alien style slime. Wow. Another fizzy, bubbly version of LEGO Slime is this bridge building adventure. Build a bridge over the slime for your minifigs. Here is the video I was telling you about. In it you’ll hear a basic explaination of what is happening scientifically. There are quite a few ways to make slime. I would stick with the suggestions made in the links for the activities if you want to do the activity and have it turn out like you see in the pictures. If you just want to experiment (and why not, right?) try different recipes and see which your boy likes best. They all have a different texture, stretchiness and feel to them. The kit below with the glue has everything you need to make a slime shown in the video. Or try the Glow in the Dark Slime Science Lab – fun! I like this extras kit because it has a great variety of add-in and it is inexpensive for what you get too. This is really neat! My boys will love this! Thanks for sharing! Oh good! I hope they enjoy themselves with some of the ideas. Thanks for sharing on Monday Madness this is awesome! Very fun! My kids really like making slime out of Elmer’s glue and liquid starch. Thanks MaryAnne! Yes, that is a great way to make slime–have fun! I love these new ways to play with LEGOS! I never thought of incorporating them with slime. They are pretty neat aren’t they. I saw one and needed to go find some more. Lots of fun! You are most welcome Helen. Thanks for having it. Thanks for sharing such fun at our FB Share day! !